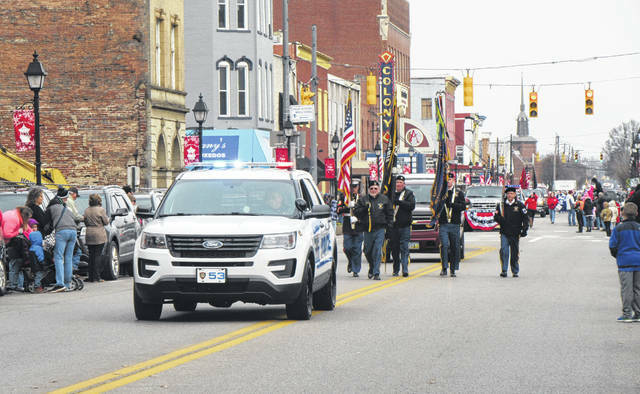 The Gallipolis Police Department escorted the Christmas parade down Second Avenue on Saturday afternoon. Santa made his way through the parade on top of the Gallipolis Fire Department truck. 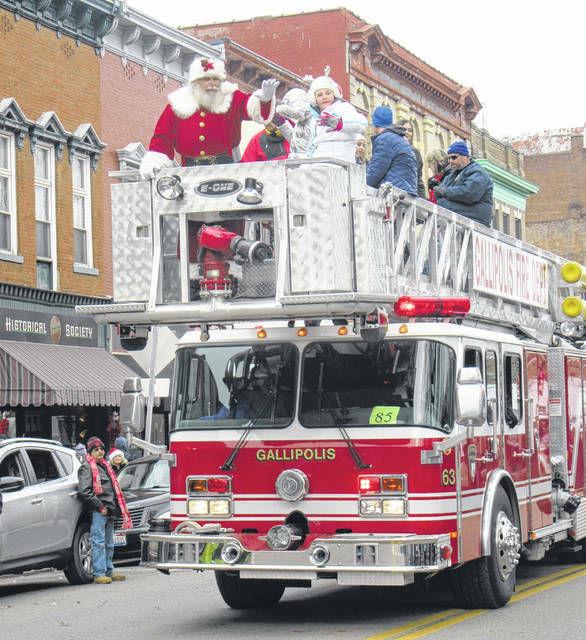 GALLIPOLIS — Dry but chilly temperatures greeted parade attendees on Saturday for the annual Gallipolis Christmas Parade. The parade had been postponed from its traditional date on the first Saturday of December due to rain. Despite the change, the parade included dozens of entries from local churches, schools, organizations, businesses and more. As is tradition, Santa arrived at the end of the parade, riding on a fire truck. The Gordon family had the honor of serving as this year’s parade marshal in memory of the late Gallipolis resident, city manager and area philanthropist, Robert Gordon, more commonly known as Bob or Bobby Gordon. Gordon died on Sept. 24 and has long been remembered as a director of the children’s residential treatment program at Woodland Centers, a Gallipolis city manager, an executive director of the Gallia-Jackson-Meigs Treatment Alternatives to Street Crime organization as well as a Gallipolis Health commissioner among his many other services to the Gallia community. Other parade participants included the Gallia Academy Marching Band, the combined South Gallia and River Valley Marching Bands, Gallia-Meigs Performing Arts, The Gallipolis Shrine Club, The Ohio Department of Transportation with the painted snow plows and many local fire departments, among others.